The finest coffee in New Guinea comes from the Sigri estate, in the Waghi Valley of Papua New Guinea, where climate, soil and elevation combine to create ideal growing conditions. 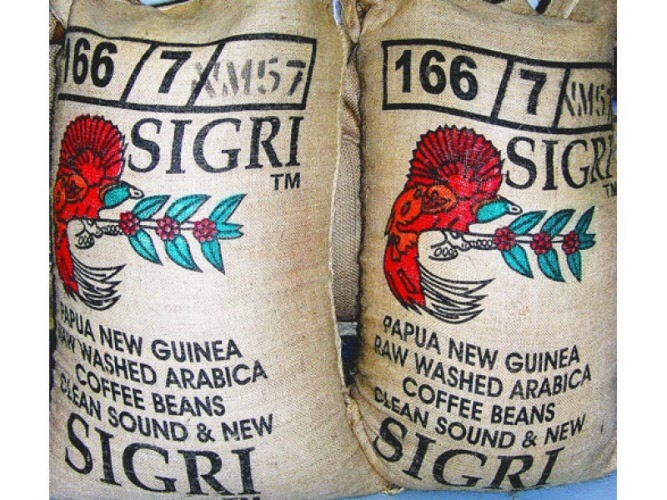 Sigri plantation, in the Western Highlands Province of Papua New Guinea, was established in the 1950s and rapidly gained a reputation that has continued to grow with Sigri being internationally recognized as producing a gourmet coffee equal to the world's best for more than 20 years. All plantings are exclusively Arabica, concentrating on the Typica varieties which originate from seed introduced to Papua New Guinea from Jamaica Blue Mountain Typica rootstock. Coffee is grown at 5000 feet in elevation. Profile: Full, rich body with hints of spice and a clean refreshing finish in the cup expect a unique flavour profile which has a hint of smoky, hickory background note reminiscent of better Jamaica coffees. Layered, refined sweetness.